Dual gigabit-speed Ethernet ports outfit the Yealink SIP-T48G for fast telephony and data transfer. PoE supports also turns this VoIP phone’s Ethernet ports into power supplies, enabling its to receive power over Ethernet cabling. Enjoy HD voice through this Yealink phone’s full duplex speakerphone, the handset or through a connected headset. The RJ9 port and USB port support a wide range of compatible headsets, including Bluetooth headsets through a USB adapter. As is, the Yealink SIP-T48G hosts up to six line appearances and one busy lamp field. An expandable design let you add on to the phone’s telephony access. All of these fantastics features aside, what you’ll first notice on the Yealink SIP-T48G is the massive 7-inch touchscreen. Easily access contacts, applications and more. 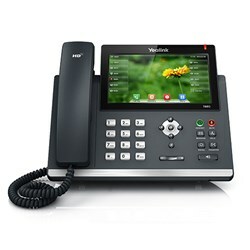 This VoIP phone is SIP interoperable, boasting certified compatibility with Asterisk, 3CX and other standard phone systems.